Ah Robin Hood; man who fought with quarterstaff and bow to defeat injustice and provide for the less fortunate. Or was it a murderer with a sword set out to exact vengeance on his personal enemies? Perhaps a little of both? Depending on how far back you go, you might be surprised to learn the origins of the Robin Hood myth. In medieval times a man named an outlaw lived in the forest, led a band of men loyal only to him, fought the established and corrupt law of the land, took dirty money away from the rich and redistributed it among the poor, and did it all with a smile on his face, a quip on his tongue, and a knack for always outsmarting the bad guys. This is the modern interpretation of the Robin Hood legend, one that always puts the notorious outlaw on the side of good as a philanthropist. In fact, “robs from the rich and gives to the poor” is so firmly ingrained with the concept of Robin Hood the name is seen as a compliment. Barry Greenstein, a professional poker player that donates all his tournament winnings (in the millions of dollars) to charity, has collected the nickname “The Robin Hood of Poker”, to illustrate the point. Going back to the beginnings of the Robin Hood stories, however, one finds that he was not always depicted as a good guy, or even a nice guy. Like King Arthur and many other legends, what is considered canonical today is often discovered to be very different at the roots. There are, however, a number of elements that seem to crop up in any modern telling of the Robin Hood story. His band of Merry Men, though not always called by that name, always seem to number more than a hundred, although only a few are mentioned by name. Those few, Little John, Friar Tuck, Alan-a-Dale and William Scarlet, are most often present in any Robin Hood tale. His love for the Maid Marian was a latter addition but a popular one. His enmity with the Sheriff of Nottingham, his skill with a bow, and the fact that he was a wanted man living in the forest, are all fairly standard items of lore. An examination of the first stories, however, show that even these corner stones of myth were not always present. Like King Arthur, the first mentions of Robin Hood appeared not in complete stories, but in mentions in other stories and even legal documents. In fact, the term “Robin Hood” was more frequently used than any mention of an individual person, almost as if the idea of an outlaw determined to fight law and order was universally accepted as “a” Robin Hood before “the” Robin Hood put in an appearance. 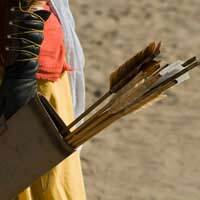 There are those who claim that the Robin Hood myth is based on a real person. Fulk FitzWarin, for example, was a Norman noble who lost his title and was forced into exile as an outlaw and the enemy of John of England; many of the Robin Hood stories seem to mirror this chain of events. Interestingly the earliest of stories do not, which suggests that the authors of the later tales of Robin found inspiration in the tale of FitzWarin. Similarly one will notice that as time went on the tales of Robin Hood became more and more tame. Earliest mentions had Robin as a self interested outlaw, and no mention of giving to the poor was made. As time passed more noble elements were added to the story, including female interest (Maid Marian) and a loyalty to the King, absent though he was fighting the Crusades. Robin wasn’t the only figure to undergo retro-fitting; his enemy the sheriff was an adversary because it was his job to be in the early stories- in the latter he became a corrupt, bumbling, sometimes evil man. Robin Hood’s story and myth has undergone a lot of transformation in the centuries it has been around. With the themes that have been infused into the tales- nobility, self sacrifice, philanthropy, fighting for the Greater Good, it is likely that the story of Robin the Hood will endure because and despite the tampering.